*Please note, the office and ticket window will be closed on Tuesdays and Thursdays from 11:45am-1:15pm for departmental events. All other hours of operation are subject to change. Student Life & Activities accepts payment for purchases in the form of Visa, MasterCard, Discover, cash, and check. We no longer accept American Express. Checks must be made payable to Brookdale Community College. Join Student Life and Activities for our Spring 2019 Bus Trips! See below for trip details! Tickets can be purchased at the Student Life and Activities ticket window – SLC 101. All prices include the bus. Student Life & Activities reserves the right to limit or discontinue the sale of community tickets at any time. Harlem Globetrotters – Fan Powered World Tour Comes to Brookdale! Two dates: Tuesday, March 5th and Wednesday, March 6th. Games begin at 7pm in the Collins Arena, located on the Lincroft Campus. Brookdale Students – $12 (with valid ID), Brookdale Faculty/Staff – $24 (with valid ID). Limit two (2) tickets per Brookdale student/staff member at the SLA Ticket Window. Saturday, March 9th – The bus departs from Parking Lot 1 at 8am. Two (2) tickets can be purchased at the student/faculty/staff discount rate. Additional tickets may be purchased at the community rate. Wednesday, March 27th – The bus departs from Parking Lot 1 at 3pm for a 7pm show. One (1) ticket can be purchased at the student/faculty/staff discount rate. Additional tickets may be purchased at the community rate. Thursday, April 4th – The bus departs from Parking Lot 1 at 5pm for a 7pm show. Passes to AMC Theaters, Bow Tie Cinemas and Cinemark theaters are available at the Student Activities Ticket Window (Lower Level Student Life Center) year round. Current students and employees of the College can buy two (2) tickets per week at the discounted rate. Purchasers must present their valid Brookdale OneCard to receive the discount. Please contact the theaters directly for information on movie time-schedules and any possible pass restrictions. Student Life & Activities reserves the right to limit or discontinue the sale of community tickets at any time. 2019 Gold Six Flags Great Adventure Season Pass w/ Parking: Students – $60, Staff – $77, Community – $77. Limit (1) per season at Student discount. Additional may be purchased at Community rate. 2019 Six Flags Great Adventure Single Day Pass: Students – $35, Staff – $50, Community – $50. Limit (2) per week at Student discount and additional may be purchased at Community rate. 2019 Hurricane Harbor Single Day Pass: Students – $25, Staff – $37, Community – $37. Limit (2) per week at Student discount and remainder at Community rate. 2019 Single Day Parking Pass: Students – $10, Staff – $20, Community – $20. Limit (1) per week at Student/Staff discount and remainder at Community rate. Brookdale has partnered with NJ Transit to offer student discounts on monthly passes. 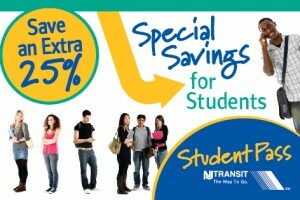 Full-time students riding NJ Transit rail and bus can save 25% and avoid the hassle of finding parking. To purchase a discounted NJ Transit ticket, log into Web Advisor and click on the link under the student section. Your student pass will be mailed to you monthly. Enjoy the convenience of auto-pay combined with easy to use online account management. Further details are available here from NJ Transit. If you are a member of a club or organization, or a faculty member planning a class trip, ask the office of Student Life & Activities about NJ Transit group discounts.